This friendly, hands-on guide is an excellent introduction to the world of herb gardening. It gives you tips and advice to grow a thriving herb garden that will add depth and flavor to home-cooked meals-as well as boost your health. 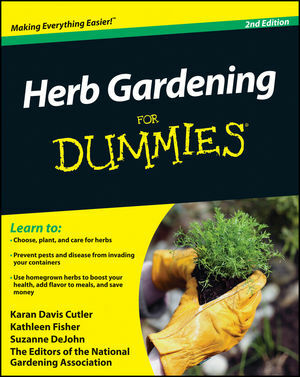 Whether you're interested in getting step-by-step instructions for starting on your first herb garden or already have one and want to learn new tips and techniques, Herb Gardening For Dummies, 2nd Edition has you covered! Suzanne DeJohn is an editor with the National Gardening Association. The National Gardening Association is the leading garden-based educational nonprofit organization in the United States, providing resources at www.garden.org and www.kidsgardening.org. Chapter 1: Why Grow Herbs? Part II: Deciding How and What to Grow. Chapter 3: Getting to Know Your Home Ground. Chapter 4: Designing Your Herb Garden. Chapter 5: Herb Garden Plans. Chapter 6: Herbs in Containers, Indoors and Out. Part III: Getting Down to Earth. Chapter 7: There's No Place Like Loam: Preparing Your Soil for Planting. Chapter 8: It's Time to Plant. Chapter 9: Everyday Care and Feeding. Chapter 10: Managing Pests in Your Herb Garden. Part IV: Cut and Dried: Handling the Herbal Bounty. Chapter 11: Harvesting and Preserving. Chapter 13: Herbs for Healing and Soothing. Chapter 14: Herbs for Beauty. Chapter 15: Herbs for Hearth and Home. Chapter 16: Ten Gifts to Make from Herbs You Grow. Chapter 17: Ten Lists of Herbs for Different Uses and Garden Situations. Appendix: An Encyclopedia of Herbs.